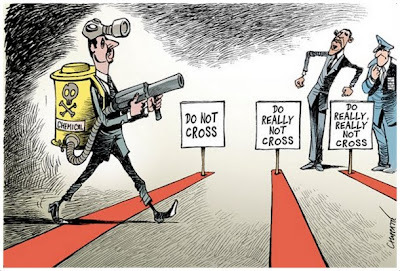 I chose this cartoon (right) because I doubt Barack Obama would ever lift a finger against Bashar al-Assad. The U.S. president will keep dithering, even if Iran produced “the bomb” and nuked a city held by the Syrian president’s opponents. I reached this conclusion after reading, scrutinizing and pondering Obama’s remarks in the Oval Office going into his bilateral meeting with Jordan’s King Abdullah. When strong evidence emerged earlier this year that Assad forces were moving chemical weapons, the White House insisted the action did not cross the line Obama set. By “move” the weapons, a White House spokesman said, Obama meant transferring them to a terror group, like Hezbollah. After the British and French governments wrote to UN Secretary-General Ban Ki-moon saying they had evidence of chemical use in Syria, Obama had his secretary of state and defense secretary say separately the intelligence regarding the attacks remained inconclusive. Hardly four weeks after Obama’s March visit to Israel, where he said proof of chemical weapons use would be a “game changer,” Israel’s senior military intelligence analyst said the Assad regime had repeatedly used chemical weapons in the last month, and criticized the international community for failing to respond. But the letters added: "Given the stakes involved, and what we have learned from our own recent experiences, intelligence assessments alone are not sufficient -- only credible and corroborated facts that provide us with some degree of certainty will guide our decision-making." This gets us to last night’s round of dilly-dallying by Obama in the presence of King Abdullah. THE PRESIDENT: I want to welcome to the Oval Office once again King Abdullah. His Majesty is a great friend of the United States. Jordan is a great partner to the United States on a whole host of issues. And obviously, although we just recently saw each other -- and I want to thank again His Majesty for the extraordinary hospitality that he showed during our visit -- there remain a host of very urgent issues in the region that we’re going to have an opportunity to discuss. First of all, I want to congratulate His Majesty on a series of reforms that he’s initiating inside of Jordan, and we want to find out how we can continue to be supportive and helpful in creating greater economic opportunity and prosperity in the area. We have been supportive with respect to loan guarantees and other efforts, in part because we’ve also seen King Abdullah take some very important steps to further open democratization and entrepreneurship and economic development inside of Jordan. We want to encourage that because we think Jordan can be an extraordinary model for effective governance in the region. We’re also going to have an opportunity to talk about the Middle East peace process. And the last time I saw King Abdullah, I’d just come out of Israel and the West Bank in consultations with Prime Minister Netanyahu and President Abbas. And Jordan, like the United States, has an enormous stake in peace. And we do think that there’s a window of opportunity that needs to be seized, and so we will both consult in how we can jumpstart serious conversations that could lead to a peaceful settlement and both a secure Israel with normalized relations with its neighbors and a Palestinian state that was sovereign. 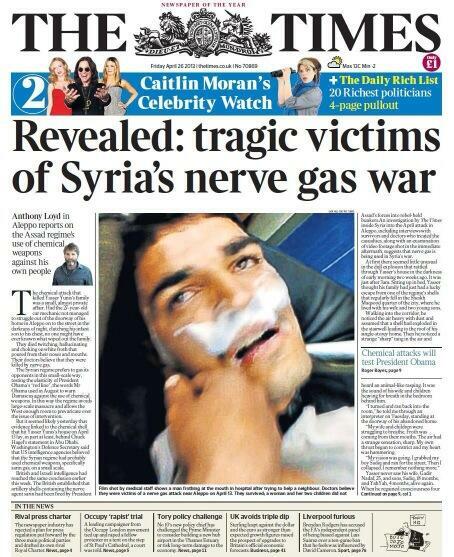 Of great urgency right now obviously is the situation in Syria. Jordan has experienced a huge influx of refugees coming into the country from Syria, people who’ve been displaced. Jordan historically has maintained open borders and allowed these refugees on a humanitarian basis to come in, but it’s an enormous strain on a small country. And we are mobilizing international support to help with these refugees, but obviously our goal is to create a stable Syria, where civilians are not at risk. And we both agree that at this point, President Assad has lost legitimacy and that we need to find a political transition that allows a multi-sect, democratic transition to take place so that Syria can be a place where all people can live in peace and harmony. This will be difficult to accomplish. And yesterday, some of you saw that I asked my people to brief Congress about the fact that we now have some evidence that chemical weapons have been used on the populations in Syria. Now, these are preliminary assessments; they’re based on our intelligence gathering. We have varying degrees of confidence about the actual use, but there are a range of questions around how, when, where these weapons may have been used. So we’re going to be pursuing a very vigorous investigation ourselves, and we’re going to be consulting with our partners in the region as well as the international community and the United Nations to make sure that we are investigating this as effectively and as quickly as we can. But I meant what I’d said, and I will repeat that it’s, obviously, horrific as it is when mortars are being fired on civilians and people are being indiscriminately killed. To use potential weapons of mass destruction on civilian populations crosses another line with respect to international norms and international law. And that is going to be a game changer. We have to act prudently. We have to make these assessments deliberately. But I think all of us, not just in the United States but around the world, recognize how we cannot stand by and permit the systematic use of weapons like chemical weapons on civilian populations. So this is going to be something that we’ll be paying a lot of attention to -- trying to confirm, and mobilize the international community around those issues. But in everything that we do, we very much appreciate the kinds of support, advice, counsel, and partnership that we have with His Majesty and the people of Jordan. And we look forward to a fruitful consultation this afternoon. HIS MAJESTY KING ABDULLAH: Mr. President, thank you very much. We’re delighted to be back here again. And may I first start off by expressing, on behalf of myself and the delegation and people of Jordan, our heartfelt condolences on the tremendous tragedies both in Boston for the bombings, as well as that of Texas -- especially that of Boston. We've always stood together in our fight against terrorism, and this is an issue that we will always be strong partners there. As you've mentioned, sir, on the issue of the peace process, when you were in Jordan, we had mentioned this is the homework stage. Jordan will continue to work very closely with the Israelis and the Palestinians, obviously with our American allies to see how we can bring both sides closer together. But one of the major concerns that brings us here to Washington together, as you alluded to, is obviously the challenge with Syria, the fragmentation of Syrian society, which is becoming more and more alarming. Since your last visit to Jordan five weeks ago, we've had over 60,000 refugees -- up to over half a million, so we're at 10 percent of an increase of our population. We're so grateful to the support that you and the American people have given to our country. You couldn’t do more, quite honestly, and we're so grateful. I just wanted to express our appreciation on behalf of myself and the Jordanian people for that. I think, sir, that we are both working very hard to look for a political solution for a Syria that is one that is, as you mentioned, inclusive so that we're bringing everybody together, which is sort of our last hope to -- as we're now seeing the surge of the second threat appear, which is that of militant terrorist organizations that have risen over the past several months. But I am confident, with your leadership and with meetings that we will have today, that we can find a mechanism to bring a solution -- to an end as quickly as possible. Lastly, sir, you had the Crown Prince of the United Arab Emirates, Mohammed bin Zayed, who is one of our strongest strategic allies. And I know that is his position with the United States, as well as the Kingdom of Saudi Arabia -- the three of us are working very hard in cooperation with the United States to try to find a quick and just solution to the Syrian crisis. So I look forward to our discussions later this afternoon, and I hope that together we will be able to alleviate the suffering. PRESIDENT OBAMA: You guys all have the same question? PRESIDENT OBAMA: Hold on a second, miss -- one at a time. What we have right now is an intelligence assessment. 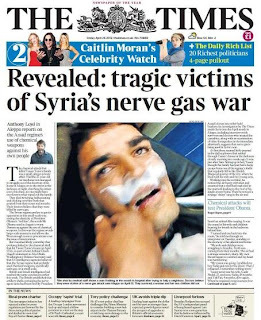 And as I said, knowing that potentially chemical weapons have been used inside of Syria doesn’t tell us when they were used, how they were used. Obtaining confirmation and strong evidence, all of those things we have to make sure that we work on with the international community. And we ourselves are going to be putting a lot of resources into focusing on this. And I think that, in many ways, a line has been crossed when we see tens of thousands of innocent people being killed by a regime. But the use of chemical weapons and the dangers that poses to the international community, to neighbors of Syria, the potential for chemical weapons to get into the hands of terrorists -- all of those things add increased urgency to what is already a significant security problem and humanitarian problem in the region. So we're going to be working with countries like Jordan to try to obtain more direct evidence and confirmation of this potential use. In the meantime, I've been very clear publicly, but also privately, that for the Syrian government to utilize chemical weapons on its people crosses a line that will change my calculus and how the United States approaches these issues. So this is not an on or off switch. This is an ongoing challenge that all of us have to be concerned about. And we're going to be working with the international community and our partners to keep our eyes on what's happening on the ground, to gather any evidence of potential chemical weapon use and, at the same time, to continue to help with a moderate and inclusive opposition to help bring about the day when the Syrian people can once again focus on living their lives, raising their children, starting businesses, and obtaining basic freedom and human rights. This is going to be a long-term proposition. This is not going to be something that is solved easily overnight. But I know that King Abdullah is committed to trying to find these kinds of solutions. So am I.
Labels: Assad, Britain, France, Israel, Jordan, King Abdullah of Jordan, Obama, Syria, Syria chemicals, U.S.